Home · Property Management · Landlord Forms : Is Your Lease A Ticking Time Bomb? Is Your Lease A Ticking Time Bomb? Every landlord wants a lease agreement that’s tough. But did you know that if your lease is too tough, it could cause legal problems? 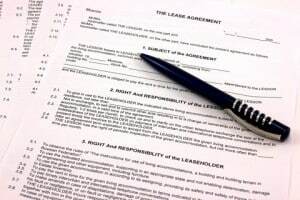 In legal terms, a standard lease agreement is called an “adhesion” contract. That simply means that there is one party who drafted the agreement, and possesses all or most of the power in the negotiation. A lease agreement is a “take it or leave it” proposition. There’s nothing particularly wrong with that, unless the lease provisions are too oppressive. Then, an adhesion contract may be viewed as “unconscionable.” Tenants are forced to abide by disagreeable terms in order to get what they need — a place to live. Courts will restore the balance the power in an unconscionable contract by refusing to enforce some or all of the provisions. An Iowa landlord learned that lesson when his tenants joined forces, initiating a legal battle over provisions in the lease that a court ultimately determined were unconscionable. The landlord argued (unsuccessfully) that he didn’t enforce any of the illegal provisions, therefore there was no harm in including them in the lease. But the judge found that these provisions could be intimidating to a tenant. Next, the court will decide whether demanding that tenants sign such an unfair lease violates the state’s consumer protection laws — the same laws that govern door-to-door sales and telemarketers. Consumer protection statutes generally allow for significant penalties. Leases must be carefully crafted so they cover all of the bases, without going to the extreme. Does your lease put you at risk? When evaluating your lease agreement, there are two aspects to consider. The first is to identify any specific provisions that could be illegal. These may include seemingly innocent provisions that are only illegal in your particular locale. For example, some states allow attorneys fees against a tenant, and other states strictly prohibit that provision. Attempting to shift your legal responsibilities onto the tenant is another potentially illegal term. The Iowa landlord required tenants to agree to pay for repairs and upkeep that were not the tenant’s fault. Other common problem lease provisions include excessive late fees, application or administrative fees that may be prohibited locally, or any attempt to override the law, like extending the period allowed to return a security deposit. Controversial terms hidden deep in the “fine print” can also be viewed as unfair. Your attorney can help you identify these potential problem spots. The other aspect of the lease agreement that you should evaluate is the overall impact. Rather than looking at one particular paragraph, a judge ruling on a lease dispute will consider all things together. Not only do the separate paragraphs of the lease have to mesh, but the lease, coupled with the leasing policies, must be fair. Let’s say you charge a nonrefundable pet fee for cleaning the carpet. At the same time, you reserve the right to deduct from the security deposit a carpet cleaning fee. If you attempt to enforce that provision and take both the fee and the deduction, these lease terms may be viewed as unconscionable. That’s even more likely to happen if you take the deduction even when the tenant cleans the carpet. To avoid lease problems, the best defense is to know your responsibilities under the law. From there, choose a reputable lease form to work with, and avoid modifications that add fees, change the tenant’s responsibilities or shift liability. When you have your draft lease completed, run it past an attorney, just to be on the safe side. Also, try to resolve disputes with tenants before things get heated — it’s almost always cheaper that way! Need a lease form? Check out the AAOA’s state-specific landlord forms.